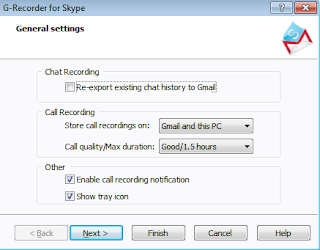 G-Recorder is a Skype plugin that makes it easy to record Skype calls and chats. They are both automatically sent to your Gmail account and labeled by type (Skype Calls, Skype Chats) for easy searching, viewing or listening. * Skype calls (MP3) and chats are stored in "clouds", searchable and accessible to you anytime from anywhere. * Your Skype calls are recorded to MP3 format - you can replay the MP3's in Gmail just in place without downloading. * No matter how many computers you use Skype on, your conversations are merged in Gmail from all the computers in chronological order. * You won't lose Skype chat history when you change computers or just reinstall Windows. * Powerful and user-friendly Gmail interface to work with your Skype conversations like with e-mail.